Ronnie Holmes III knew by fourth grade that he wanted to pursue a career in engineering. And he knew that the Syracuse City School District’s Say Yes to Education program would make it possible for him to earn the college degree needed to achieve that dream. After attending five different schools in the district, Holmes graduated from the Syracuse Academy of Science in 2016 as class salutatorian. Holmes says that he strived to be the best student he could be and was motivated by his own personal desire to succeed. “But the majority of my motivation comes from my mother, who is earning a degree in political science through University College,” he says. Holmes saw firsthand the struggles and challenges his mother overcame as she worked full time while raising a family and attending college as a part-time student. 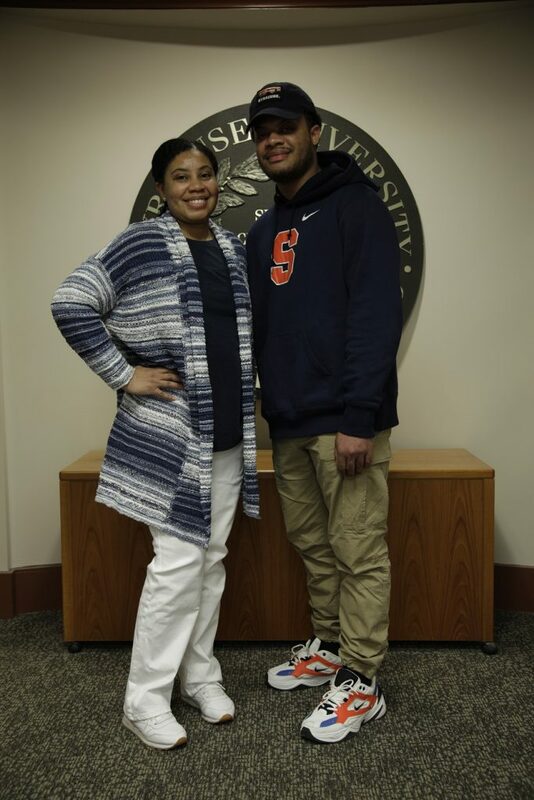 In May, Holmes will be in attendance when his mom, Angela Gunn, graduates from Syracuse University with a bachelor’s degree in political science from the College of Arts and Sciences and the Maxwell School. “I feel a great sense of pride knowing that, against all odds, she was able to persevere and conquer such adversity. It is difficult to describe how I will feel when I watch my mom walk the stage,” says Holmes. Like her son, Gunn looked for an affordable way to attend college. She found it through the Arthur O. Eve Higher Education Opportunity Program, which provides access to Syracuse University for economically and educationally disadvantaged students from New York State. Holmes also began his career at Syracuse University as a part-time student at University College. And, like his mom, he works full time while attending college. Holmes works as an assistant manager at Finish Line. The pair motivate each other to succeed. “My mother inspires me to never settle for less. I have seen how hard she has worked to get where she is today and I would like to do the same in my own life,” says Holmes. Gunn has dreams of her own as well. “I would actually like to go graduate school and pursue a career in law,” she says. “That’s my dream job.” Gunn says that having a college degree means she won’t have to place any limitations on what job she can have in the future.